Well.... I can say I’m amazed. It’s true what they say about the P365. I had the opportunity to handle one yesterday and couldn’t leave without it. Welcome to the club. It is a very, very interesting firearm. Try it in your PM9 holsters. It fits perfectly in every one of mine. I hear the trigger is similar to a Kahr. Maybe NOW Justin will start thinking about a double stack? Hmm??? 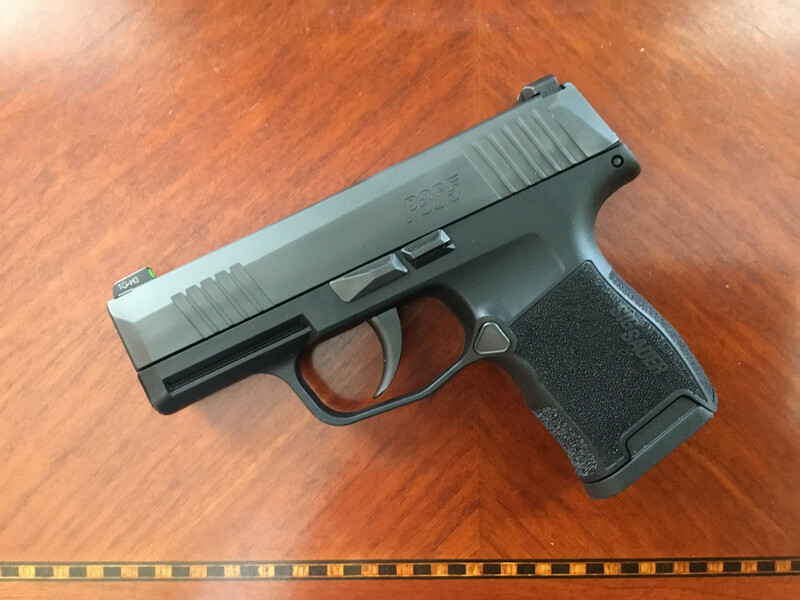 Like yqtszhj said the P365 is virtually the sane as the cm9,pm9 and the MK9. I got my P365 yesterday and I am on my way to shot it now. I measured the p365 against the MX9 and the triggers are almost identical as far as position and length of pull. I took my MK9 out of it's holster (Garret Silent Thunder) and am using the holster to carry the P365. Fit is almost exact too. I will see how close the triggers are compared for pull weight. More later. Yep, it’s incredible it fits them all, even the kydex. I actually have an older stiff leather holster for the cm9 and the Sig is looser than the Kahr. Need to get me a DeSantis Nemmis dedicated to this too for pocket carry. It deserves its own holsters. If it wasn’t for mowing the grass I could have shot it today. The trigger to me seems like a cross between a XD and a glock. The sights are nice. The front sight jumps out at you. I've got the hots for one of these bad...Still haven't been able to find one to check out yet...My only reservations are about the problems they had at first but it seems they have those issues under control...I pocket carry and was wondering about the width at the bottom of the magazine that prints in jeans, is it much wider there than a PM9?....As much as I love my PM9 I really like having more ammo in the gun ready to go rather than possibly having to fumble with a reload....All in all this seems like the best of both worlds with size vs ammo capacity....Hope to fondle one soon.. Someone needs to buy a couple and move to California. After they get here, hopefully they won't find use for two and decide to sell one.....to me. Back from shooting my P365, only 50 rounds today. No failures of any kind, tight targets and a trigger that I like. In my opinion my MK9 and the P365 both have light triggers, which I like. 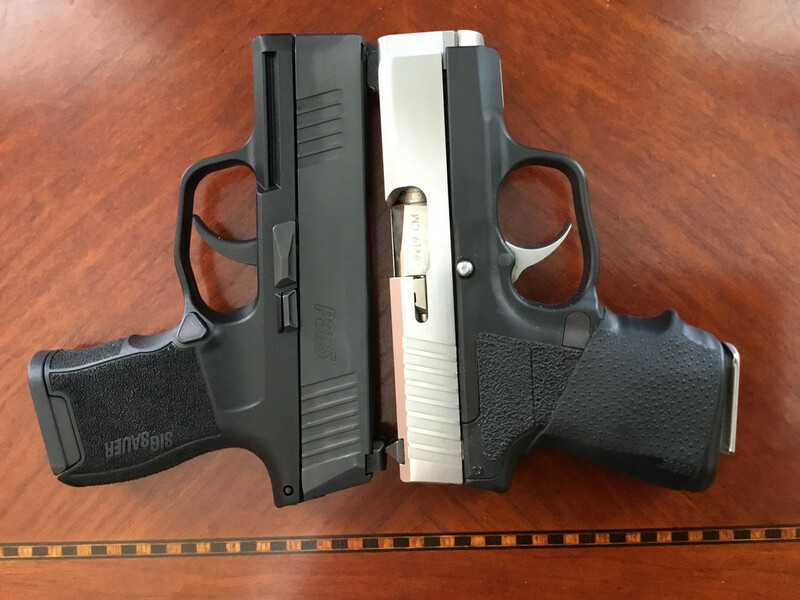 The difference I noticed is the Kahr has a light pull all the way through. Makes a question of exactly when it is going to release. The Sig has a slack take up until it gets to the release spot which is a definite release and you know when it's going to happen.